A panel of experts will discuss how new patient-centered label standards were adopted by the California Board of Pharmacy and the Department of Veterans Affairs. Additionally, research will be shared regarding current label trends, what patients like and don’t like about medication labels, and ways to improve medication use, especially among patients with low literacy. 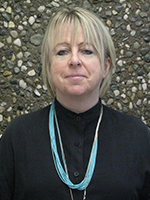 Virginia Herold is the executive officer of the California State Board of Pharmacy, a position she has held since July 2006. The board regulates over 140,000 individuals and businesses that compound, dispense, ship or store prescribed drugs for or to patients and practitioners in California. Consumer protection is the board’s mandate. The California board is the nation’s largest state board of pharmacy, and is looked for its innovative efforts and leadership to protect patients. Ms. Herold holds MS and BS degrees from the University of California. Keith Trettin is a pharmacist and Program Manager with the VA National Center for Patient Safety. His recent professional interest focuses on Veterans’ health literacy and how the VA can present drug information in a patient centric manner that enhances Veteran compliance to their drug regimen, improves clinical outcomes, and reduces overall health costs. Keith’s work has led to the adoption by the VA of a patient-centric prescribed label. 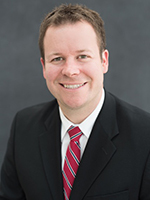 Clark Kebodeaux, Pharm.D., BCACP, is a clinical assistant professor of pharmacy practice and science at the University of Kentucky College of Pharmacy. He graduated from the University of Kansas School of Pharmacy and completed a PGY1 community pharmacy residency at the University of Kentucky College of Pharmacy. 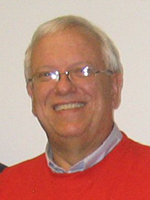 Dr. Kebodeaux is an adjunct faculty member at the School of Nursing at St. Louis University and coordinator of the online advanced pharmacology course for advanced practice nurse practitioners. Dr. Kebodeaux has a practice and research interest in health literacy, particularly regarding patient-provider communication, student education, and medication labeling. There has been a need for universal standards for prescribed container labeling to address medication misuse due to inadequate understanding of label instructions. 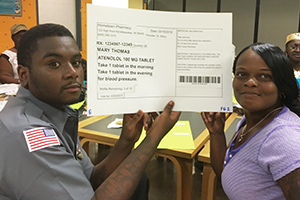 United States Pharmacopeia (USP) developed patient-centered label standards for the format, appearance, content, and language of prescribed medication instructions, to prevent medication errors, promote patient understanding and medication adherence. Currently, based on state adoption, 1 in 4 Americans may have access to a patient-centered label. In the latest revision of the standard, three significant areas of usage were addressed: metric dosing, use of the Universal Medication Schedule and standardized alternative patient-centered labeling for the visually impaired. Dr. Schwartzberg received her B.A. from Harvard, M.D. from Northwestern, and is a Clinical Assistant Professor of Preventive Medicine and Community Health at the University of Illinois’ Chicago College of Medicine, Adjunct Assistant Professor in General Internal Medicine and Geriatrics at Northwestern University Feinberg School of Medicine, and Scholar-in-Residence at the Accreditation Council for Graduate Medical Education. Dr. Schwartzberg has been working in the field of health literacy and clinician-patient communication since 1997. She was co-chairperson for the United States Pharmacopeia Prescr!ption Container Label Expert Panel that developed standards for the patient centered label. 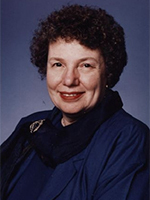 She currently serves on the USP Healthcare Quality Expert Committee and chairs the USP Health Literacy Expert Panel. 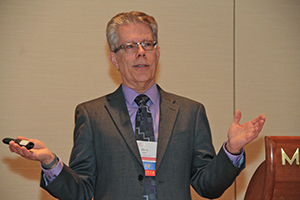 The Medication Label Summit is offered by Wisconsin Health Literacy, with support of the Advancing a Healthier Wisconsin Endowment of the Medical College of Wisconsin. Major sponsors of the Medication Label Summit are Gunderson Health System, Healthy Dane, Lilly, Bristol-Myers Squibb, Marshfield Clinic & Security Health Plan, Wisconsin Hospital Association Foundation, WPS Health Solutions, and MetaStar, Inc.
Hotel accommodations are available here. For more information about the Medication Label Summit, contact Lauren Werner: lauren@wisconsinliteracy.org or 608-257-1655, ext. 6. 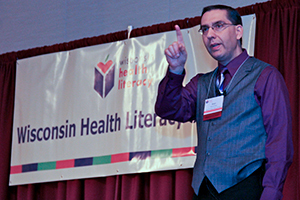 Over 350 people attended the 2017 Wisconsin Health Literacy Summit, which focused on how improved health literacy can help individuals become more engaged with their health and healthcare. An additional 80 individuals attended the Medication Label Summit centering on how improving prescription drug labels can help patient understanding. Visit our Summit page for more information. Wisconsin Health Literacy is working with a patient advisory council to design easy-to-read medication labels. Our work has impacted about 3 million prescription labels in Wisconsin. Read more about this project. Wisconsin Health Literacy offers training and/or consulting services customized to an individual organization and/or specialty.